Violence has a long history in U.S. schools, with recorded incidences dating back to the early-20th century. More recently, the concept of active shooters armed with military-grade weapons has found a permanent home in the American landscape. And that is changing how schools are designed. Russell Davidson, principal and president of KG&D Architects, in Mount Kisco, NY, and former president of the American Institute of Architects, said that AIA members have been designing for security for some time now. These days, however, lessons learned from military and embassy projects have made their way into planning for K-12 schools and religious facilities, in particular. As schools increase their security, however, the challenge is to make students feel like they're still in a school setting rather than a prison or military installation. "It's a delicate balance — a fine line we always walk," said Felicia Dunham, senior associate at Mark Cavagnero Associates, in San Francisco. "And that's where the magic happens. If we do our jobs well, you will not notice it's a secure environment." 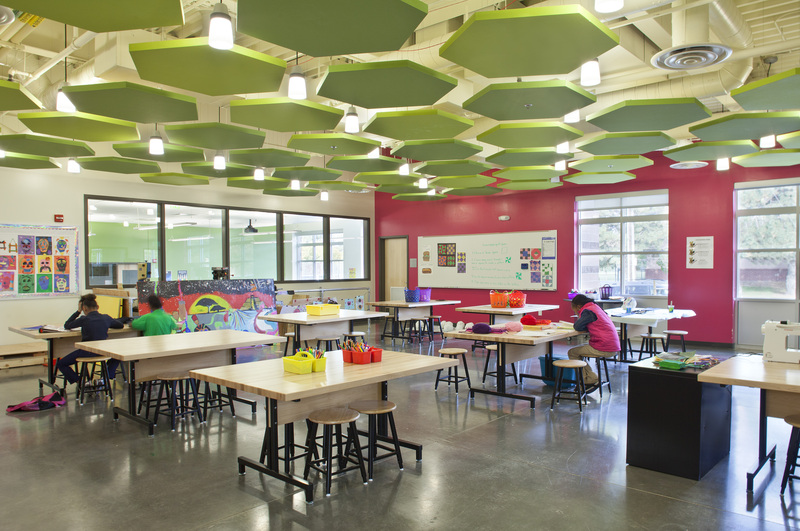 The process behind creating that ideal learning backdrop doesn't just weigh the threat of an active shooter, for example, said Kelly Yamasaki, architect at OZ Architecture, in Colorado. It also considers the day-to-day security issues that staff and students face. Vandalism, bullying and custodial battles that get out of hand — they're all concerns. "A lot of what we think about has to address all the issues," Yamasaki said. Tansparency and line of sight are two design strategies to accommodate those needs. Bathrooms are one area that is receiving special design attention. Removing the entry door — similar to the setup at many malls, stadiums and public gathering spots like movie theaters — offer privacy by way of a labyrinthine entrance. That means the stall and sink area aren't visible from outside the bathroom, protecting those inside, Yamasaki said. And the acoustics of open-air design make potential graffiti artists or bullies a little more cautious about acting up. A vestible can be used to stage visitors away from students. 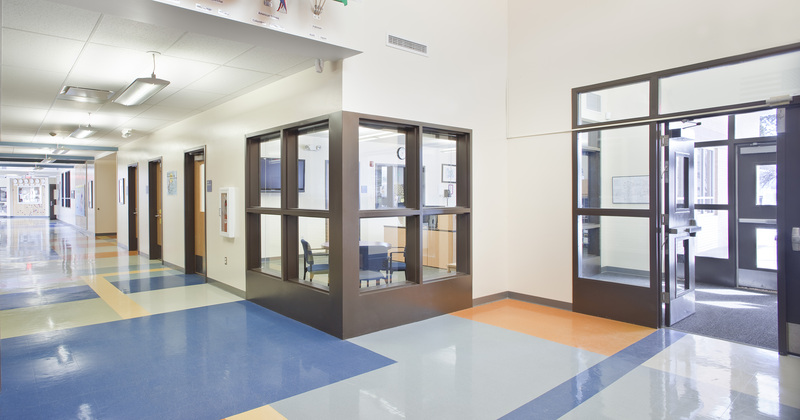 Windows into hallways and sometimes between classrooms are another way school staff and security can monitor students without forsaking a creative, encouraging environment. Windows must be placed carefully in classrooms, Yamasaki said, so that in the worst-case scenario, someone going from classroom to classroom intent on doing harm cannot see the entire room through the glass. A variation on that design, she said, is to take four or five highly transparent classrooms — meaning they have ample interior and/or exterior windows — and group them together in a pod-like structure that can be isolated with a door or other partition. This design features wide hallways, which classes can also use as shared breakout space. In case of emergency, however, students can remain in the locked sections, safe from harm. There are times, too, when transparency creates potential security issues of its own. For its upcoming move downtown, the performing arts–focused Ruth Asawa San Francisco School of the Arts wanted to showcase its new urban digs, Dunham said. Administrators initially wanted to create a flow between the school and the community by putting performing arts instruction spaces in front of large windows at street-level. Recognizing that the security of students is first and foremost, however, the school ultimately decided to locate those areas to an upper floor. "This also provides visibility into the classrooms from outside the building but with separation from the street," she said. Partitioning is an effective tool in secure design, but Davidson said the best way to make a school safer is from the property line in rather than from the classroom out. For instance, he said, a secure (and popular) approach is to create a single entrance with a vestibule that can be used as a de facto staging area for visitors. School districts, he said, are also spending hundreds of thousands of dollars on cameras and electronic monitoring systems that use sensors — tripped whenever a door opens — to monitor activity throughout the school. "It's money well spent," Davidson said. School exteriors also present a unique design challenge, and the extent depends largely on where the school is located. Yamasaki said schools in Colorado typically create a line of sight from within the school out into the school grounds so that no one can approach children or the school building undetected. There are also procedures in place at many schools, Davidson said, to bring children who are playing outside into the closest building in case of a threat. These security features and design elements are fairly easy to implement in new construction, but what about renovations? Kathleen Langan, vice president and national practice leader of program and construction management at McKissack & McKissack said the feasibility of a secure-design overhaul varies from project to project. "It really depends on the extent of what is being left in place in the facility," she said. Preserving elements of historical buildings also presents some limitations on new features, she added. Yamasaki said local police or school district security also collaborate on all significant school projects. "There is a stepped series of criteria that law enforcement looks at to try to make sure the building is as safe as we can make it," she said. Windows between classrooms should offer a partial, not a full, view. Langan said that the school projects McKissack works on also feature input from local law enforcement. "On the design side," she said, "we meet and coordinate with local law officials [to review] the design … and listen to their recommendations." McKissack gets feedback on both internal and external design, including location of the administrative offices, how visitors enter buildings and security camera placements. While security is important to school districts, she said, the big drivers behind school design these days are the new ways in which teachers interact with students. "Now more than ever," Langan said, "revolutionary teaching methods are driving designs in schools." These include Wi-Fi throughout the building, flexible space to support group and interactive learning, moveable furniture and project-based learning. Ultimately, it's about balancing the goals of teaching and learning with those of everyday security. "Those elements need to be done in a way that doesn’t undermine the education environment," Yamasaki said.